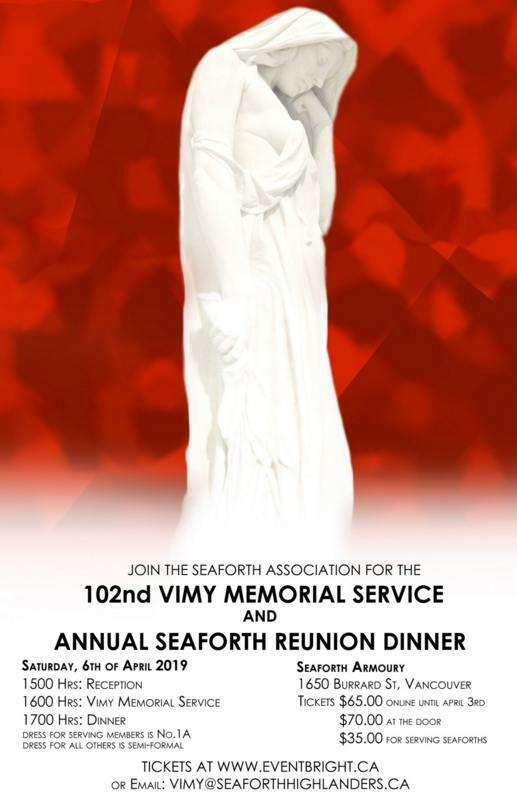 The 2019 Vimy Memorial Service and Annual Reunion Dinner will be held at the Seaforth Armoury Saturday April 6th. The Dinner is open to serving members of the Seaforth Highlanders of Canada and members of the Seaforth Highlanders of Canada Regimental Association. This year’s Vimy Dinner will feature a highland dance performance by Shot of Scotch Vancouver together with the Seaforth Highlanders of Canada Pipes and Drums. Tickets for serving Seaforths are $35.00 each, and for Association members $65.00 each. Please note guests are encouraged, and ticket prices for guests are $65.00 each. Attendees are encouraged to purchase tickets online via Eventbrite as soon as possible to guarantee their participation. Also this year the Association is appealing that members reach out to those members of the Regimental Family who may not have attended the Vimy Dinner in recent years.